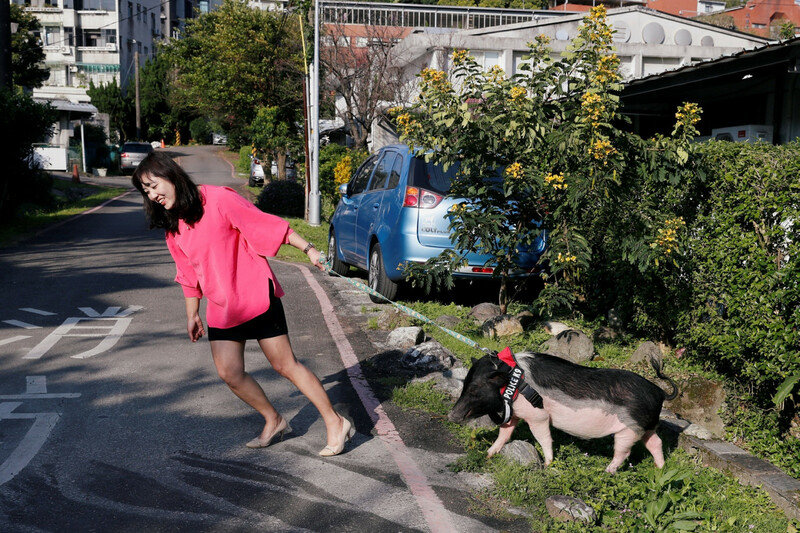 With the Lunar Year of the Pig starting on Tuesday, pig lovers in Taiwan fear that a rush of people wanting to usher good fortune into their homes by getting a piglet as a pet may lead to a wave of abandoned pigs later on. Pigs like her "Xin-Xin" and "Mei-Mei" have the intelligence of a five-year-old child and can open everything from fridges to doors and drawers, often ripping out everything inside, to the horror of their homecoming owners. "Piglets are very attached to people, they will constantly squeak to make you play with it or feed it," Chen said, adding that many overwhelmed owners abandon their pet piglets in just a few months. "We don't advise this as they are farm animals," said farm owner Yang San-guei. But if visitors won't be warned off, Yang said he is willing to sell a piglet for 3,000 NTD ($98). The other little piggies go to market when they outgrow their pen. "So that they know how big these pigs can grow and find an adequate veterinary hospital and educate themselves about the medical and nutritional aspects," he said. Many owners also soon realize that having a porcine pet can seriously crimp their holiday plans. Pethotels do not accept pigs. Publicly funded shelters don't accept pigs as they are not classified as pets, leaving it to pet loversor private shelters to take them in.